In recent two posts of this blog, Photographic Gear Evolution II – EVIL vs DSLR and New Z6 and Z7 Nikon EVIL cameras, have been discussed some apparent constrains using former well reputed lenses over a mirrorless full frame camera and also the particularities of the new appeared Nikon mirrorless camera bodies beside the new brand dedicated lenses. After the release of the last Canon full frame mirrorless, it seems that the new approach has come to stay. Nevertheless, as always when a new approach is announced, there are both skeptical and strong opposite opinions. In order to be realistic, a wise advice is do not immediately confront our limited knowledge to the large and deep amount of specialized knowledge achieved by the engineers of top camera manufacturers. If first Sony and Hasselblad and nowadays both Nikon and Canon have decided to change their concept of what must be a professional full frame camera, this is a signal. If all of them take the same path, this is in my opinion a consolidated change. One of most commented doubts on this new approach is about the capability of the new dedicated lenses to compete with the well reputed lens systems offered by both Nikon and Canon after almost sixty years of lens design for SLR and DSLR camera bodies. Often the answers are in the air and far beyond the confidence we can have on the Sony, Hasselblad, Nikon or Canon engineers. Optics is one of the most developed science areas and it continues growing today for a lot of life applications. In this way, to design a lens accomplishing with the on sensor image registering requirements is not the hardest task those engineers must afford. Let’s analyse some information appeared about those new mirrorless cameras. In a transcription of his interview (1) (https://www.imaging-resource.com/news/2018/08/28/nikon-z7-engineer-interview-deep-dive-q) to Motohisa Mouri, Section Manager, 1st Optical Designing Section, 3rd Designing Department, Optical Engineering Division of Nikon, Dave Etchells wrote he was wondering about the question “How did they arrive at the Z-mount’s dimensions?”. Mouri-san answer, among other concepts, was that “…Having larger-diameter elements so much closer to the sensor surface means that light rays can strike the sensor surface more straight-on (telecentric), and that it’s much easier to control things like lateral chromatic aberration…” and here it appears a clue word, “telecentric”. Telecentric lens design is commonly used on lenses suited for metrology imaging. They provide a different properties than other designs as zero angular field and constant magnification. This is very useful to thereafter take measures on a given image and relate this measurements with the actual object properties. Telecentric lenses design encompasses three basic schemes, object field telecentric, image field telecentric and double telecentric. Beyond the complexity of the optics theory involved, one important characteristic of telecentric designs is that in the second and third cited schemes, the image forming rays are parallel to the optical axis and consequently, they strike the sensor surface at a right angle. Here is another clue concept, “large bayonet diameter”. Derived of all above stated is the fact that if the camera body design implies a shorter flange focal distance (FFD), an optimal lens must be accordingly designed. And this is what camera manufacturers are doing. Let’s take an example comparing a couple of equivalent lenses from Nikon, being respectively constructed under the former (F) and the new (Z) mount specifications, the Nikkor 35mm f/1.8 G ED (F-mount) and the new Nikkor Z 35mm f/1.8S (Z-mount). The Fig., 1 shows as in the lens used with DSLR camera bodies the design is a classic retrofocus with marginal rays hitting the corner of the sensor at a moderate angle at the nominal FFD of 46,5mm. Below, on the same Fig., 1, the new lens with a much more shorter FFD of only 16mm, shows a completely new design (more telecentric). The marginal rays are even more perpendicular to the sensor surface minimizing the earlier stated constrains. Figure 1. 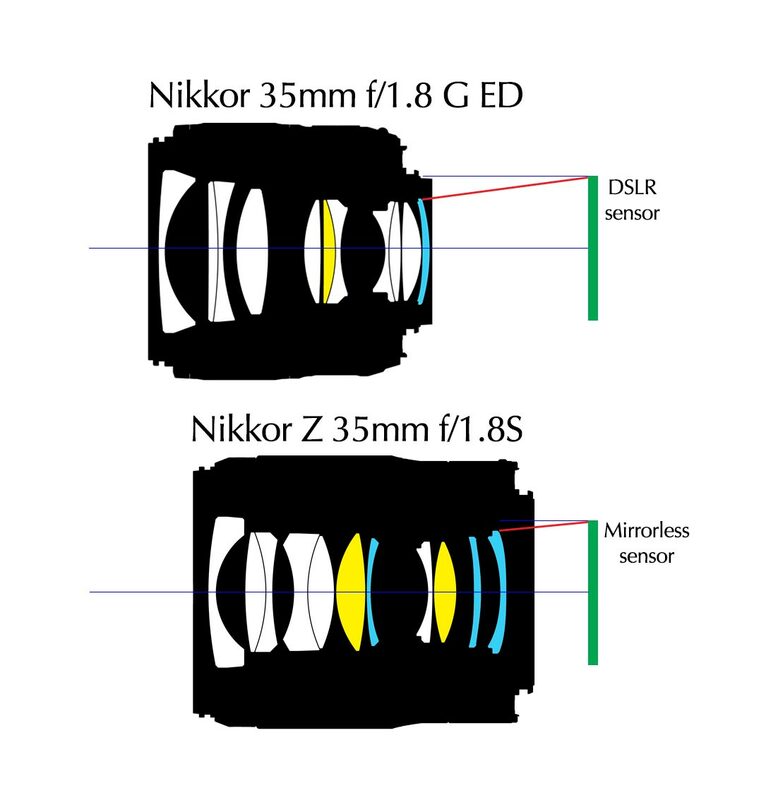 Comparison between the Nikkor 35mm f/1.8 G ED (F-mount) and the new Nikkor Z 35mm f/1.8S (Z-mount) (click on the image for a larger view). Another important aspect shown in the Fig., 1 is that the new Z-mount from Nikon allows more room to allocate even larger rear lens elements. This can be advantageous to follow improving the lens telecentricity as well as the lens maximum aperture. It does not seem risky to say that we are facing a “really new approach” on professional camera bodies and lens systems. Good news are also that the FTZ mount converter allows for using the necessary focal length lenses not yet existing in the new Z-mount version. Former lens, with its longer FFD of 46,5mm permitted by the FTZ converter, will provide a bit bulkier but useful combination with the new camera bodies and its new features. In terms of image quality, the use of the FTZ converter with former lens, will not perform worse than when were mounted on a DSLR camera body. It seems that this intermediate and temporarily approach is also the adopted by Hasselblad with the X1D mirrorless and Canon with its new EOS-R carrying also a new and larger RF-mount. After all this discussion, another conclusion we can take is about the use of well reputed “antique” lenses mounted on the new mirrorless camera bodies. 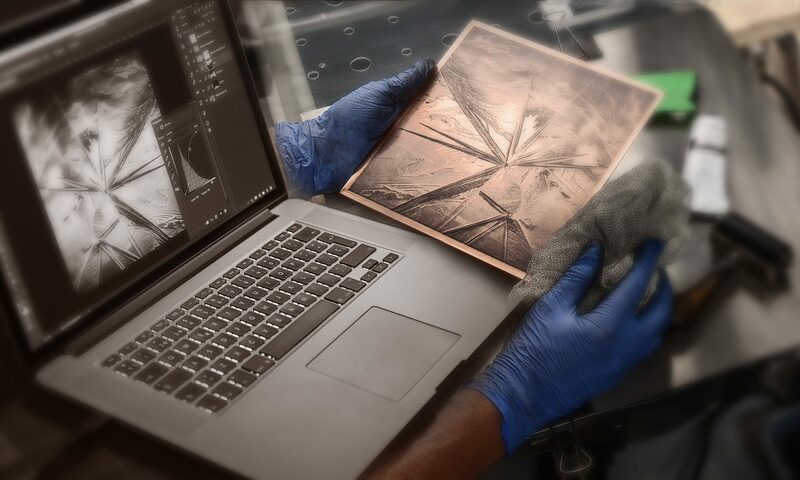 There are at least two reasons showing constrains about its success in imaging quality performance. The first one is its own optical design. As stated earlier, the results of light hitting the flat film surface are almost invariant all over the film frame including the field corners. Only vignetting can be expected, which in turn do not necessarily implies a lower image quality. When those lenses are used to form an image on an electronic sensor, carrying a thick complex of filters on its surface, the result is not only the expected vignetting but also a poor corners image quality, mainly for tangential structures. This lenses were designed for an image formed onto an invariant surface as film was, but electronic sensor it is not. Sensor is light ray angle dependent. 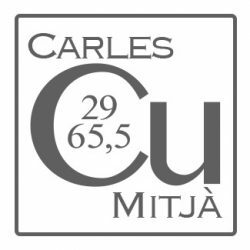 This was both detected in previous assays for a combination of the Hasselblad X-Pan 45mm on a Sony A7II camera body and also for the low level proprietary “kit” zoom lens (https://carlesmitja.net/2018/08/06/photographic-gear-evolution-ii-dslr-vs-evil/). The second annoying fact is that most of those “must” antique lenses were designed for non AF camera bodies. The focusing rings were mechanically but accurately coupled to the telemeters in the viewfinders and to the actual lens to film distance. An infinite focusing ring adjustment was expected to be a true infinite focusing on the film. This was one of the reasons justifying its relatively high price. But most of nowadays converter rings, nor the majority of coupling bayonets cannot fulfill with those narrow mechanical tolerances. The nowadays camera bodies receiving AF lenses they are usually self-adjusting systems depending on the AF modules criteria better than on a mechanical adjustment. A visual focusing confirmation on the magnified camera display and/or the use of hyperfocal distance adjustment can avoid sharpness surprises with this fine lenses mounted on modern camera bodies. Good news aren’t always complete, but looking at the future we have a lot of reasons to follow believing in the passion for well done things. (1) ETCHELLS, Dave (2018) A deeper dive with the Nikon Z7 engineers. On line: https://www.imaging-resource.com/news/2018/08/28/nikon-z7-engineer-interview-deep-dive-q Last visit: September 23, 2018. Nice and very interesting post. Very clear also. It seems that a new change is coming. Better lens means differents designs and mounts wider. We will be expectant.